Stiaan Scheepers starts his day doing what most kids fear – maths. Addition, subtraction, fractions and division are child’s play to him. Scheepers is a nine-year-old mathematical prodigy capable of crunching complex sums at exhilarating speeds. Numbers don’t intimidate Scheepers. Not when he’s faced far worse. 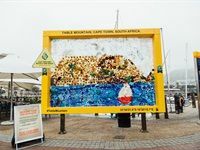 Read Stiaan Scheepers' full story here..
On this past Global Recycling Day, Sunlight Dishwashing Liquid transformed the iconic yellow frame at the V&A Waterfront with plastic waste to create awareness on the importance of recycling. Check out the frame below and images of the creation process.